You will earn 8,156 Reward Points. Earn 1 reward point for every 1 dollar spent. Heavy duty electric griddles available in five (5) widths; 24" (610mm), 36" (914mm), 48" (1219mm), 60" (1524mm) and 72" (1829mm). High performance, high volume production with even, consistent, controlled temperatures. 3/4" (19mm) thick griddle plate complete with grease trough and splashguard. Optional grooved griddle tops in 12" (305mm) wide sections. All models are designed as freestanding units or bank with other E24 series equipment or with G24 series gas counter. Stainless steel front and sides. 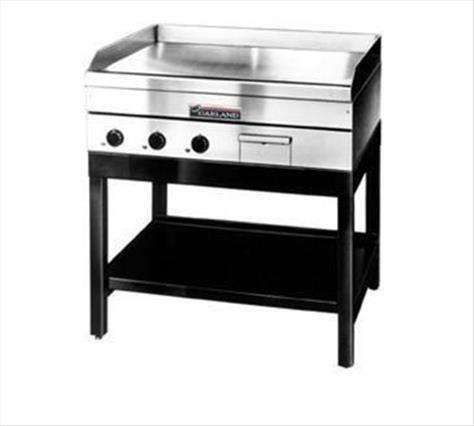 100°F (35°C) to 450° F (235° C) hydraulic thermostats with pilot lights are provided for each 12" (305) width of griddle surface. Even frying temperatures are assured by specially designed pressure clamped tubular heat elements.